Fallen leaves are a big contributor to tannin in ponds, with water turning yellow as the leaves sink and decay. Tannin is an organic carbon based substance that causes pond water to appear brown or yellow in color. The substance is a natural occurring by-product of decomposing organic matter that enters your pond water, and the amount of tannin is directly related to the amount of debris present. During decomposition when beneficial pond bacteria begins breaking down debris, tannin is released into the water which eventually builds up and causes problems with clarity. Anything organic can release tannin, but in ponds the most common causes are leaves, soil, grass, and fish waste. Tannin usually comes in the form of fumic acid or humic acid, and can slowly contribute to acidity (decreasing pH) of pond water over time. This and the reduction in water clarity makes tannin undesirable for most ponds, with it generally being removed to maintain clearer water. Is tannin bad for your pond? In low quantities tannin is mostly an aesthetic concern, making water slightly less clear and giving the pond a tea-like color. Pond owners with low or moderate levels of tannin usually choose to treat the water to obtain better clarity, especially if you have gold fish or koi. Since mechanical and biological filter media cannot remove tannin by itself, it can slowly build up to higher levels were it can soon become more of a concern. Tannin in larger volumes will drastically reduce water clarity, making it very brown or yellow in appearance. The problem with tannin is it always comes from decomposing organic matter, and when pond bacteria works to break down this waste, oxygen is depleted during the process. 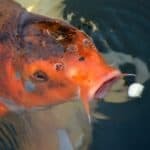 The lower levels of oxygen, combined with heavy tannin-laden waters, can cause real problems for your pond fish. In this environment of lower oxygen, tannins begin to contribute to the problem of acid water, slowly raising the pH over time. If the pH of your water raises too high, fish will soon become sick and can quickly die. The ponds nitrogen cycle will also be negatively affected, with bacteria working less efficiently as ammonia and nitrogen slowly build to harmful levels. In most situations, ponds will never reach a volume of tannin that will cause these kind problems, but it’s often better to treat a pond with rising tannin levels just in case. 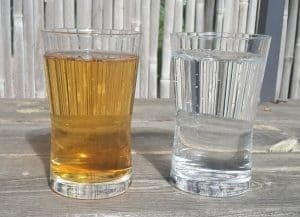 If you want a clear pond especially, the less tannin in your water, the better your water clarity! How do you measure tannin? Measuring tannin levels in a pond is not an exact science, and is usually determined from a simple “eyeball test”. Visually checking the pond water in a glass and comparing each day to see if there are any color changes occurring. If the yellow tinge is becoming more pronounced, a treatment is usually recommended. Most pond owners will choose to treat their tannin problem as soon as it appears, as clear water is always a very desirable feature for garden ponds. When to treat pond tannin is up to you! If you want maximum water clarity, we recommend an initial treatment to remove the bulk of the color, and then a maintenance routine to prevent it from coming back. Garden ponds with only a slight yellow tinge do not necessarily need to be treated unless you feel the tannin level will get worse in time, or if perfectly clear pond water is important to you. Since Tannin is an organic pollutant, and it has no benefits to pond water, removing as much as possible won’t effect your ponds health. In terms of tannin concentrations, see the information below which shows approx tannin in parts per million (ppm) and the corresponding water color. To note, anything above 2.0 ppm (darker tinge of yellow) we would recommend treating, especially if you have fish! One of the easiest ways to remove tannin from water is with a highly absorbent and fine filter media material called Polywool. This material will be able to directly absorb tannin, as well as catch finer organic debris which may be contributing to the overall problem. Most mechanical filter media isn’t fine enough to catch such small particles, so polywool is used for maximum filtration on top of normal media. It can be added directly to your filter box, but you will need to monitor pressure build up carefully afterwards. Due to how fine the material is, it can greatly reduce water flow and can slowly build pressure inside your filtration system. If you’re having problems with pressure build up, it can instead be added directly under the filter outtake hose, under a waterfall, or even a fountain. A container or basket with holes can be fitted with the polywool and water passed through it to catch tannin and debris. The material will need to be changed once it becomes clogged until desired water clarity is achieved. This could be every few days, or once a week, depending on debris and tannin volumes. It’s best to start with a thickness of around 12-15mm, and then slowly increase the thickness as as water clarity improves. Thin media can be folded and doubled up, or a thicker product can be purchased up to a maximum of around 50mm. Another method of removing organic pollutants, such as tannin, from pond water is by using high quality activated carbon. Activated carbon is a great way to remove all kinds of harsh pollutants that your mechanical and biological filter media cannot remove by itself. Chemicals such as pesticides, chlorine, perfumes, and tannins can all be effectively removed by adding activated carbon to your ponds filter system. Activated carbon can be combined with polywool media for the best results, and is usually placed within a mesh filter bag inside your filter box. As water passes through the mesh bag chemicals and tannins that touch the surface of the carbon are neutralized. The neutralized chemicals stick to the outer surface of the carbon, which means the activated carbon will need to be frequently replaced until all tannin is removed. The best activated carbon will have a very large surface area for chemical neutralization to take place, allowing faster and more efficient chemical removal. Below we have listed our favorite activated carbon products for removing tannins and other organic pollutants from ponds. These can be added for water color removal until clear water is achieved, and then added every few months as a maintenance dose to prevent pollutants building up again. For more information on the benefits of activated carbon, check our full guide here. If the combination of polywool media and activated carbon are not removing color fast enough, or if you are already considering a pond clean up, performing a water change will help reduce tannin levels in water. This is not something we recommend over filter media or activated carbon, as water changes will reduce beneficial bacteria populations and introduce fresh chlorine into the pond system which is present as residue in mains water. A water change will certainly help improve water clarity, but we always recommend treating the water with a dechlorinator afterwards to remove any residue chlorine which can harm fish and kill pond bacteria. Dechlorinators are safe for pond fish and plants, and are a very effective way to neutralize tap water. If you’re considering water changes to remove tannin and improve clearness, we recommend a dechlorinator for best results; some of which we have listed below for convenience. Since most problems with tannin will arise from organic debris that falls into your pond and eventually decomposes, investing in a high quality pond net or cover is an ideal preventive solution. Netting will stop all leaves entering your pond, which are a major contributing factor to tannin, and also help reduce sludge buildup overall. The less organic debris that can become waterlogged and sink to the bottom, the less muck and waste you will accumulate. Having a quality netting will also make cleaning your filter box easier, and extend the life of your pond pump as it will not become clogged as easily due to free-swimming debris. Most pond nets are very cheap and durable, as well as being discreet and easy to install. If you have fish, they’ll also give them more protection from predators! For a list of our favorite pond netting solutions, check our guide here for the best netting for ponds. An alternative method of removing floating debris that falls into your pond is by using a pond skimmer, which automatically filters out surface debris with water flow. Although a bit more expensive compared to a pond net, they’re easier to clean and require very little maintenance. They also have the benefit of being able to remove all kinds of debris, even smaller debris that falls through a pond netting cover. For more information on pond skimmer systems, check our guide here. Color that is leaking into your pond through sediment (soil) is often caused by a tear in your liner or an improperly secured bank. Treating a pond to remove tannins caused by sediment deposit will not help much if soil continues to seep into the water. A tear in your liner can be repaired with a liner patch kit, or with special pond liner joining tape. Liner which has been fitted incorrectly at the banks would need to be re-secured above the water line, so pond water is not in contact with surrounding sediment. If there is not enough pond liner present, you can purchase more liner and simply attach it directly using pond liner joining tape. If you have a lot of pond sludge (silt) build up, this will constantly be leaking tannin and color into your water as it decomposes. Pond sludge in large doses can also become bery bad for your pond, as it reduces dissolved oxygen and promotes algae growth. It can also leave a nasty odor around your surface water as the volume of sludge increases. The best way to remove pond muck is with a natural sludge eating bacteria product or with a pond vacuum cleaner. Both are effective at reducing sludge levels, with the vacuum being more ideal for larger ponds or fish ponds where sludge levels are usually best kept at a minimum. Activated carbon is great at removing tannin and other organic pollutants, and is also very effective when used as a maintenance dose to prevent a return of build up. Activated carbon has a range of benefits, not just restricted to color removal, and is a great product to add to your filter system. A dose of activated carbon should last 3-5 months for ponds with low tannin levels, so would only need to be replaced 2-3 times a year when used for maintenance. Check here for more information on activated carbon as well as our recommended brand picks. I have a rather large backyard pond, for the last two years it is dark brown, it does not have a filter ration system as it is too big of a pond. I believe there has been a lot of corroding leaves in it from the past two years. How can I treat the pond? We would love to have its original color back. How big is this pond exactly? Without filter media to help collect debris, your only real options would be DIY removal with a water vacuum, activated carbon treatments, removing sources of tannin (close-by foliage, trees, grasses), and possibly tannin-filters designed for house-hold use. So long as your pond isn’t the size of a lake, I think simply cleaning the bottom muck with a water vacuum and reducing the sources of tannin could make a big difference in the long-run!